After protests in France, today were protests in London. 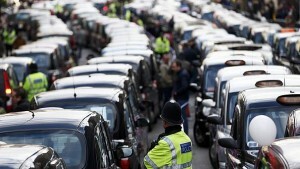 8000 black taxis blocked the city center in protest. They were driving very slowly and they blocked the streets. One of the protesters said: We do not want to abolish Uber, but we want them to respect the same rules as we do. Another taxi driver said that they must take own action after their government does not want to help with their problems. Uber offered to use their app for free a year, meaning that customers can find through them, the taxi drivers refused such an offer. “We think Uber leverages its drivers and draw from them the maximum amounts, oblige them to work overtime,” said Jim Kelly, Unite union official and pointed out that such an arrangement leads to a drop safety for users.